As Orangeville District Secondary School celebrates its 125th anniversary, a teacher looks back fondly at the storied past of the region’s first high school. The night of Sunday, February 1, 1948 was bitterly cold in Orangeville as a stiff westerly wind whipped the flames at the corner of Faulkner and Fead into an inferno. 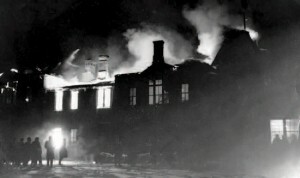 The Orangeville High School was on fire. Desperately the fire brigade and community volunteers fought to control the smoke and flames shooting from the roof. But the building was too tall and a thick sheath of ice encased the fire hoses attached to a single hydrant. Unnerving explosions added to the intensity, as ammunition stored for the cadet corps and the contents of the chemistry classroom ignited. By morning, all that remained of the proud “school on the hill” was a two-room annex and the gymnasium. The sixty-four-year-old building, once considered state of the art, was gone, but the spirit of its staff and students remained intact. Within hours the board of education and teachers were cobbling together a makeshift school. Staff had managed to remove band instruments, the office typewriter and adding machine, along with steel cabinets containing precious school records. On the bleak days following, a few more items were salvaged. “Even now, something will trigger the smell of that smoke on books and on my hands,” says Jean (Dodds) Thompson, the first, and for many years, only, secretary of the school. Although plans had been underway for some time to build a new school for the growing community, classroom space was suddenly needed urgently for nearly 200 students. 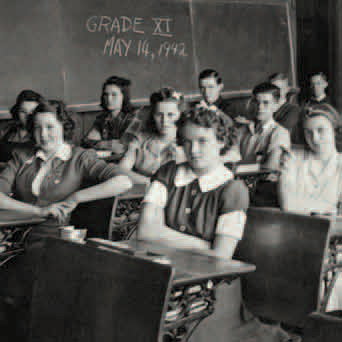 Soon grade nine students were assigned to a hall above Patterson’s Furniture, grade ten to the Pentecostal Church, grade twelve to Tweedsmuir, and grades eleven and thirteen to Westminster United. 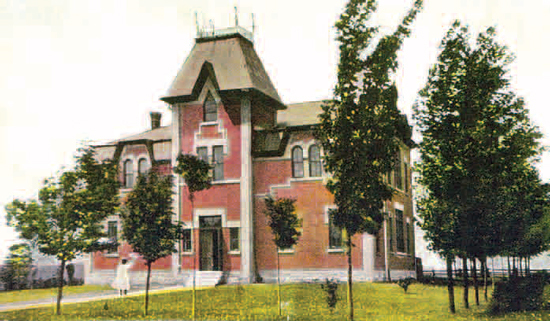 Until that time, students had attended the Orangeville Grammar School, occupying two rooms of the old Orangeville Public School on Zina Street. However, the new site was controversial. Many citizens criticized its location at Faulkner and Fead as “too out of the way” and “awkward to reach” at the top of a steep incline. Yet, as the first high school to be built between Brampton and Owen Sound, it also showcased Dufferin’s recently acquired status as a county in style. Alexander Steele, the first principal, “was loved and respected,” according to Ernest Dodds, who wrote The History of Education in Dufferin County (1983). He was also “instrumental in starting the library and a perfectionist in teaching mathematics.” A brilliant scholar in his own right, Steele was a gold medallist at the University of Toronto in English, mathematics and philosophy, and proficient in six languages. Throughout Steele’s tenure and that of his successor, Edward Hackett (1915-1941), the modestsized school established an outstanding record of academic excellence and community service. 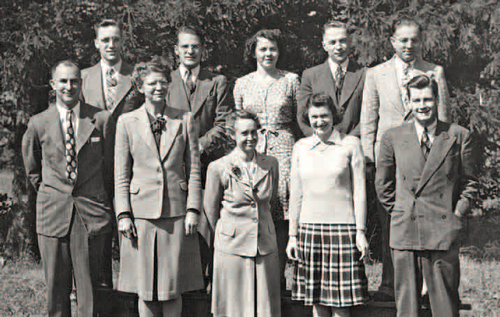 OHS staff, 1947. Back, left to right : Gordon Gibson, Claude Kalbfleisch, Jean Dodds, Andrew Percy and John Hamilton. front, left to right : Maurice Cline, Marjorie Kidd, Elizabeth McPhedran, Edith Lyons and Robert Laughlin. Retired social science head John Handy says Cline’s empathy with students carried over into the “student centred” philosophy of the school – well before that phrase became an educational buzzword. “We were ahead of the curve,” he says. Later, Morris collaborated with Jim Dods (then chair of the school board), Dr. Charles Scott and the Orangeville Rotary Club to establish the Student Aid Corporation, a source of interestfree loans for university tuition. Dods was also influential in implementing free textbooks and, at last, busing in Dufferin. In these initiatives, Cline and his colleagues actively practised the educational motto, in loco parentis (in place of a parent). It was not just students who benefitted from Cline’s generosity. He had even been known to spend the occasional summer building houses nearby for his new teachers and their young families as encouragement to stay in the community long term. More than fifty years later, Murray Young and his wife still reside in the home built for them by his principal and a fellow teacher, Gord Gibson. Cline had a powerful ally in his “fair but firm” approach in the person of Elizabeth McPhedran, a Latin and home economics teacher and a legend in her own right. 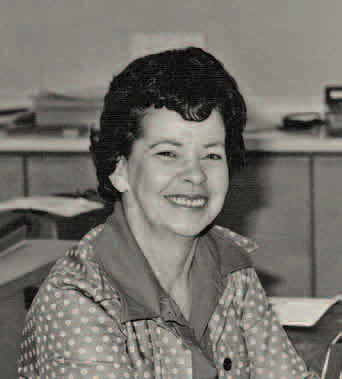 A diminutive, no-nonsense taskmistress, “Phedie” demanded a high level of performance from her students, but also garnered their affection and respect. 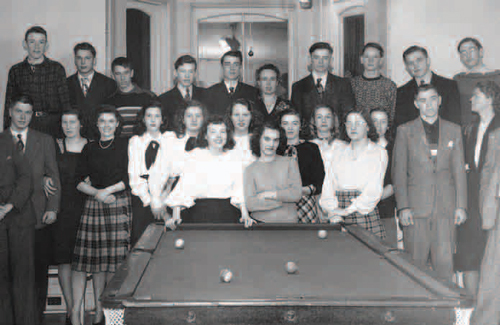 Together, school staff and the progressive board led by Dods celebrated the opening of the new Orangeville District High School – described unflatteringly by one commentator as “a one-storey sprawling mass” – on October 2, 1951. In 1964, there was a major expansion with the addition of the technical and business wings. In the late sixties, the “800 hall” and the cafetorium were added. The mysterious “tunnel” (part of the maintenance system) beneath the school has also been a source of fascination for students over the years. The rumour persists that it contained an emergency electrical generator during the Cold War. One outstanding feature of the school is its greenhouse, the jewel of an innovative environmental science program pioneered by Murray Young and now being rejuvenated by geography/ history department head and organic gardener Jamie Richards. 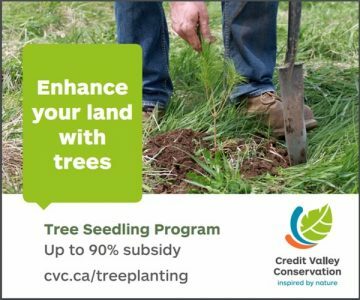 Young also still takes pride in the fact that he and his students “seeded every blade of grass and planted every tree” on the school grounds. Not all was sweetly pastoral, however. 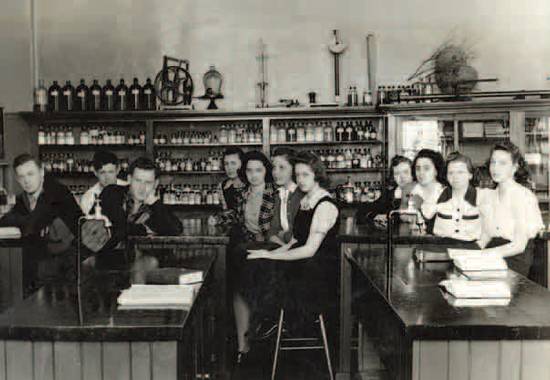 Jean Thompson recalls ruefully, “In the spring when Murray’s chickens hatched down in the science room, the smell was overwhelming. You’d have all the doors and windows open. Finally, Miss McPhedran read the riot act – either Murray went or the chickens went.” He stayed. Many of the members of that “brain bank,” from current and past generations, will be formally acknowledged this fall when the school’s Wall of Fame is unveiled during the school’s 125th anniversary celebrations on October 3. 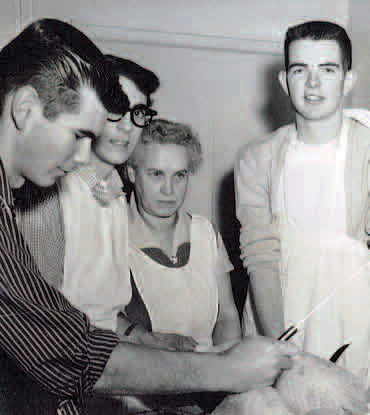 Young cites several factors for the successes of the golden years: the school’s smaller size, its rural character, and the work ethic of students and their families – the result perhaps of a time when obtaining a postsecondary education was more of a rarity and often required great personal and financial sacrifice. In a pre-Facebook and pre-textmessaging era, the school was the social heart of the community where plays, concerts, sports events and the day-to-day routines of acquiring an education brought together diverse personalities and created lifelong friendships and shared memories. Cynthia Husband (1984) remembers being in the arena – “the school by the pool” – for grade nine, where she studied math and geography just off the pool balcony and science and language in the banquet hall. “I didn’t have to have classes in the skate change room, though,” she laughs. With the school bulging at over 2,300 students, Lesley Loftus, Darryn Stevenson and Audra Cook, all 1992 grads and also now staff, were assigned shifts during which some students would have their official lunch period at 9 a.m.
Maurice Cline regularly hosted Friday-night pool games at his home for the students. At the 1983-4 class reunion this past July, several alumni shared their own memories: Dave Holden enthused about the standing-room-only talent shows on the last day of school; Paul Preston reminisced about the terrific bands, such as Anvil and Max Webster (and later, Blue Rodeo, Bare Naked Ladies and Sloan), that performed at school dances; Jude and Lisa (Barber) DeCastro, high-school sweethearts “still together after all these years,” were proud that their daughter Kristen is the student council president for the class of 2009; Cynthia Husband and Gregg Loane fondly recalled the yearbook class, canoe trips and, yes, rifle practice. Leslie Godfrey is the teacher-librarian at Orangeville District Secondary School. Wanting to throw an enormous party before she retires in June 2010, she agreed to chair the 125th Anniversary Celebration. She thanks her principal Darryl Kirkland for the opportunity. Inspired by the rich legacy of achievement at ODSS, staff and students have created a Wall of Honour in the school’s foyer to recognize alumni who have excelled in their chosen fields and/or made significant contributions to society. During the anniversary celebrations on October 3, more than 150 people will be inducted in the categories of Athleticism, Brilliance, Compassion and Citizenship, Courage, Creativity and Entrepreneurial Spirit. Dr. George Campbell, Al Pilcher, Bernadette (Casey) Bowyer, Ron Howden, Dr. Lee-Anne Laverty, Michelle (McKendry) Ruthven, Kevin Stittle, Keith Beavers and Sarah Bonikowsky (Olympic athletes); Jeff Ellis (Ontario’s most decorated high school athlete to date); Lisa Patterson (cross-country skier); Bryon Mackie (boxer); Adam ‘Edge’ Copeland and Jason ‘Christian Cage’ Reso (wrestlers), and many local lacrosse stars, including the well-known Sanderson family. Drs. Hannah and Minerva Reid (Women’s College Hospital); Dr. Bernadette Garvey and Jennifer Juno (AIDS researchers); Alan Rayburn (geographer and historian); Dr. William Waters (Professor Emeritus, Rotman School of Management) and Dr. Bill Leggett (Principal Emeritus and Professor Emeritus of Biology, Queen’s University). C.I. 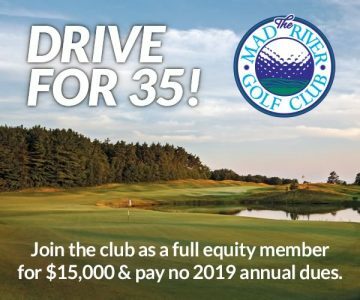 Scott and Dr. David Scott; Barry Woodyard; Bill Parke; Ross Martin and Tom, James and John Lockyer, all of whose contributions are too many and varied to list here. Veterans of the First, Second and Korean wars, and Matthew McGrady McCully, killed in Afghanistan. Archibald Lampman (Confederation poet); Gerry “The Big Bear” Barrett (aboriginal stand-up comedian); William Vickers (actor, Shaw and Stratford Festivals); Maggie Collis, John Hill, Jon French and Ray Gieringer ( film animation and special effects); Jon Dueck (film and television producer); Stephen MacEachern and Shannon Cowan (illustrator and writer). Constance Ward Harper (who conceived and organized the first flag day in the world for Belgians in World War One); Mable Elizabeth Watson (the first woman to fly with the Canadian Air Mail); Bruce Dodds (President, Charterways Transportation) and David McCleary (President, Orangeville Bottling Company et al). I hope that students remember that we (he and Gary Cook) were able to have fun and a sense of humour while we loved our subject, worked hard and produced something worthwhile. We always emphasized “be yourself, be an individual’ and we’ll handle the fallout if necessary. And that produced some really exciting things and some very dynamic individuals who have gone on to excel. I’d like to be remembered as a caring and committed educator who was there for kids, through good times and bad. Even when I’m suspending a student, I want them to know it’s for the best, because we really want to mould them into responsible citizens. I’d like to be remembered as a teacher who did lots of stuff with kids outside the classroom: canoe trips, hiking, tournaments – because sometimes you get an extremely different perspective about who that student is when you’re away from the school. I’m sure I was annoying for some students and not for others, but I’d like to think I was a catalyst for critical thinking. I’d like to be remembered as a nurturer, as someone who helped kids grow and gave them what they needed at the time. You’d like to think you’ve done something for students. If you’ve just touched them a little bit and helped them along somehow, that’s enough – and I hope that happened. I tried to treat staff and students the way I wanted to be treated myself – with respect. As well as dedicated and conscientious, I tried to be tolerant, fair, concerned and open-minded. I hope that’s what kids remember. [Because we’ve grown up in a small town] I hope to create the desire in my students to see more and know more of the world but also to know that it’s okay to come back. We all did! I hope students have had that experience of working together in a group with a common goal, not based on what fashion style you wear, or what music you listen to, that helps that student who hasn’t really found their niche as yet. I hope that we’ve affected students intellectually and that kids are thinking about the world, that they’re not so self-absorbed, that they’re actually thinking about how they can positively help the world, questioning…and also that we affected their hearts. That’s what my teachers did for me…provoking thought, provoking people to a place of action and heartfelt emotion towards humanity. I just want to be remembered! Just received “In The Hills” and began by reading this delightful article on my old High School. However I believe there is a mistake in the caption of the picture of OHS Staff. I believe 1974 is an incorrect date. I attended in 1962 and there were 27 staff members in the yearbook picture. Mr. Cline, Mr. Percy, Mr. Gibson and Miss McPhedran all looked much older in my 1962 picture than they do in your 1974 picture. Thanks for your comment Pat. And thanks for the heads up re: the photo dates. We’ll look into it. Congratulations,Lesley. You have organized a great party. ODSS deserves it. Being a teacher there for 33 years was a treasure. It was always a pleasure to go to work.The comments about Maurice Cline are so true. He was the heart and soul of the school. The 1974 date can not be correct since I had been a teacher there for 7 years at that time and you know that I would not have missed the picture. Pat, Leslie and Betty Ann, thanks for highlighting the typo on the photo caption, which now reads 1947 NOT 1974. Thanks! Contrary to popular belief Phedie was not as popular as you think. She “played favourites” to the nth degree. Also, if she didn’t like your parents she didn’t like you !! Her “marking” skills sucked! The only students who got good marks in sewing were their garments she “herself sewed” used for demonstration purposes. I could go on and on and on. Personally, I have learned over the years that her home ec skills were not very good at all. It was wonderful to read the article about this amazing school, rich in history thanks to many who walked it’s halls. For many of small town and rural kids, the expanse of the school was beyond belief and one inevitably had a class in the 800 hall followed by one at the furtherst end of the 100. I was so happy to see comments by many of the teachers who really did have an impact on my life and engrained the seeds of curiosity and strength to challenge and question. In particular, the dynamic art duo of Mr. Godfrey & Mr. Cook…I’m still painting and creating. Mr. Gravelle’s English classes definitely made me look at different genres with new eyes and Mr. Babcock’s grade 9 history classes in the room above the pool were alway lively. Thanks to all, both staff and peer, who are the heart of ODSS! Does anyone know where I can get a copy of the back cover of the 1962 year book? I drew the cartoon on the back captioned ” The End “. I was in the 9th grade. My name was Janna (Janny) Spanninga. Wow! I wish someone would please inform me if there are any ODHS reunions in future. Last I heard of one was in the 1970’s and could not attend! So sad I missed the last. We are not getting younger! Cynthia Husband and Gregg Loane – I have fond memories of the year book trip to Northbay, Ontario! Wasn’t that a great week? Always wondered what happened to you both.